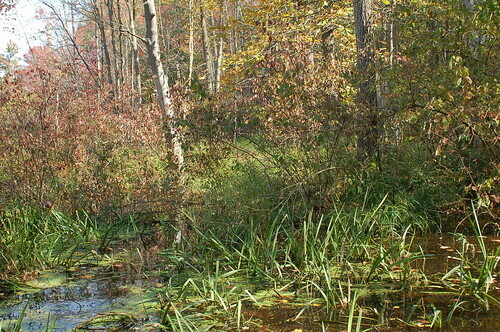 Wooded wetland between Bedell Road and the FICA landfill site. – Flood and Storm Water Control: Wetlands absorb and slow down the movement of rain and melt rater, minimizing and stabilizing water flow. – Surface and Ground Water Protection: Wetlands often store and infiltrate rainwater to the underlying groundwater system. – Erosion Control: Wetlands store and infiltrate water, reducing runoff and flooding hazards downstream. – Pollution Treatment and Nutrient Cycling: Wetlands improve water quality by absorbing pollutants, reducing turbidity, and breaking down and recycling organic materials back into the environment. – Fish and Wildlife Habitat: Wetlands are one of the most productive habitats for feeding, nesting, spawning, resting and cover for fish and wildlife, including many rare and endangered species. – Public Enjoyment: Wetlands provide areas for recreation, education and research. They also provide valuable open space, especially in developing areas like the Casperkill watershed, where they are some of the only green space remaining. Unfortunately, the importance of wetlands has come to light only recently. Before the 1970s, wetlands were often considered nuisances; places that were too wet too develop and therefore good mostly for dumping trash. Mary Ann Cunningham, a geography professor at Vassar College, told us “it was pretty typical to throw junk in a stream.” She showed us 1936 aerial photographs of the Casperkill watershed, pointing out how the FICA and Brickyard Hill landfills were both initiated in wooded wetland. In fact, the FICA landfill actually filled in the wetland so much that it displaced the Casperkill by 20 meters. The U.S. Army Corps of Engineers (ACOE) also protects wetlands, irrespective of size, under Section 404 of the Clean Water Act. Although the ACOE definition of wetland is slightly different than the state definition, the Clean Water Act protects basically the same areas as the NYS Freshwater Wetlands Act. The FICA landfill was ultimately cleaned up after a federal civil lawsuit was brought against the operators of the site in 1987 for violating the Clean Water Act and causing harm to the wetlands surrounding the Casperkill. Although the laws protecting wetlands have certainly gotten better over the years, there is still more that can be done. First, you can encourage state and local governments to enforce the acts and to establish programs to effectively protect smaller wetlands (remember that the NYS Freshwater Wetlands Act only protects wetlands that are larger than 12.4 acres). Second, if there is a small wetland going through your property, try to maintain a buffer and limit pesticide, fertilizer and road salt use. For more information about the Freshwater Wetlands Act, visit the NYS Department of Environmental Conservation website. The Regulated Activities webpage contains more examples of regulated activities and those exempt from wetland permits. For more information about federal statues governing wetlands in the United States, visit the EPA website.